I went out today to join a group hunt organized by my friend Steveouke. The weather finally turned and it promised to be an enjoyable hunt. It’s an 1898 Indian in pretty decent shape. So no silver today but the Indian is really cool. 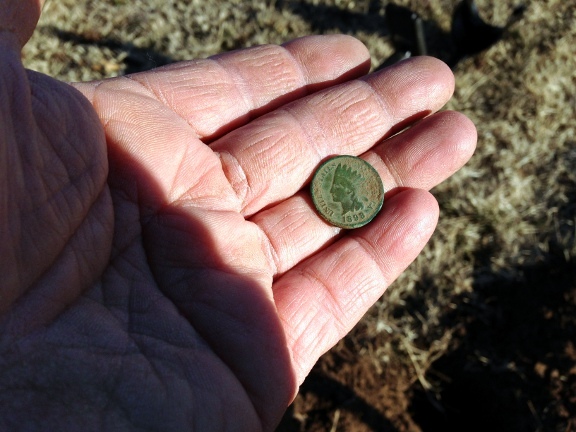 The find of the day was made by one of my hunting friends from the Friendly Metal Detecting Forum. I went to him to see his finds and he told me he had only found clad and a junk ring with no markings. He pulled the ring out and in his hand was this bulky gold ring! The reason it had no markings is because it had been obviously re-sized at one point. He could easily get $300 melt for that thing! He was happy to say the least. WOW! That is a nice Indian Head! Congratulations!